Egypt's constitution will be amended within five months, and parliamentary elections will be held two months after that. 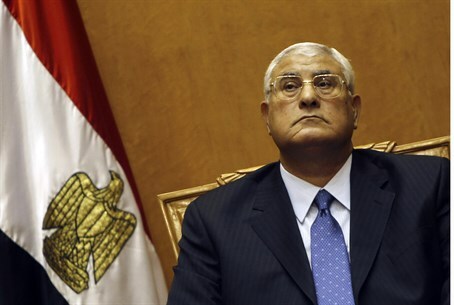 Egypt's interim president Adly el-Mansour on Monday adopted a timetable for parliamentary elections by 2014, after which a date will be announced for a presidential ballot, AFP reported. The country will have five months to amend the Islamist-drafted constitution suspended on Mohammed Morsi's ouster last week, ratify it in a referendum, and then hold parliamentary elections, according the text of the decree published by the Al-Ahram newspaper. Egypt's military, which picked top judge Mansour to succeed Morsi after deposing him amid mass protests calling for the Islamist's ouster, has promised a quick return to civilian rule. The decree's wording, however, gives the interim rulers room to further draw out the parliamentary vote, said a constitutional expert. "The way it was worded suggests that they plan to have the entire election within that time frame," constitutional lawyer Zaid Al-Ali told AFP. Article 33 of the constitutional decree was "vague" enough to allow Mansour to interpret the conduct of election as merely the start of registration for candidates, he said. That could add another two months for candidates to register, and another month for a staggered election. The news came after 51 people, mostly loyalists of Egypt's ousted president, were killed early Monday outside army barracks where they believed Morsi is being detained, prompting an Islamist call for an uprising. Armed supporters of Morsi later kidnapped two Egyptian soldiers in the Ain Shams area of Cairo. An army official, cited by state news agency MENA, confirmed the news, adding that the soldiers were pushed into a vehicle and forced to make pro-Morsi and anti-military statements on a loudspeaker. Mansour dissolved the Islamist parliament by decree on Friday, a day after being sworn in as interim president.